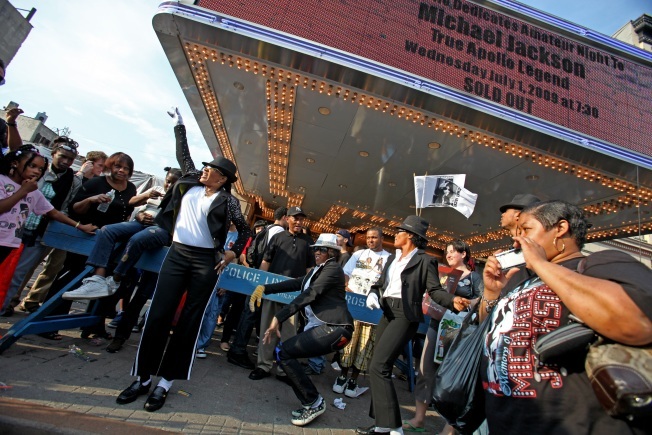 Michael Jackson fans gather outside the Apollo in the days after his death. Harlem just can't stop loving Michael Jackson. The Apollo Theater is giving the late King o Pop a spot in its "Legends Hall of Fame," the theater's highest honor. The famed theater on 125th Street said today that it will posthumously induct Jackson next spring at a gala benefit. Previous Apollo inductees include James Brown, Ella Fitzgerald and Gladys Knight and the Pips. Jackson will also have a plaque on the Apollo's Walk of Fame, which is set for construction this fall. Ongoing Jackson honors include plans to archive the "Tribute Wall," a 100-foot long blue plywood wall adjacent to the theater that has served as an ongoing memorial for Michael Jackson fans since news of his death broke on June 25th. "Inducting Michael into the Apollo Legends Hall of Fame and donating the Tribute Wall to the Apollo Theater Archives will immortalize his bond to the Apollo forever," said Apollo Theater President and CEO Jonelle Procope. Jackson and his brothers first performed at the Harlem theater in the late 1960s. The Jackson Five won its famed "Amateur Night," which catapulted their career.